Hey guys! I attended a workshop sponsored by Shiseido in their Trinoma branch last month. Luckily they offered discounts on selected items so I indulged a little. I've always wanted to try a complete line from Shiseido but the expensive tag has kept me from purchasing until now. Since I have uneven skin tone due to post breakout marks, I decided to get their White Lucent products. You get gorgeous bottles that look and feel luxurious. My vanity space has never looked so sophisticated. I didn't get all the products in the White Lucent line but I'm pretty sure I have everything I need with just three. This softener is clear, has a liquid consistency and a subtle scent that fades quickly on application. A lightly soaked cotton is all you need to spread the product all over your face. It doesn't sting even when used on active blemishes and instantly hydrates your skin making it look refreshed. This product gets absorbed easily and dries off quite fast leaving your skin feeling supple to touch. I love that every bottle from Shiseido is sealed to ensure high quality. Hooray to an ergonomically designed dispenser to prevent wastage. This serum appears milky white and seems to exude a light scent that's almost undetectable. I find it very thin and runny for a serum hence easy to apply. A single pump is enough for each use but I prefer to concentrate on areas of my face where most of my post blemish marks are located like my nose, cheeks and chin. It makes your skin look a little shiny but it doesn't feel greasy or uncomfortable. It comes in a flask type container with a pump which I think is very handy especially when dispensing runny products like this. This emulsion also has a milky white color but is a bit thicker in consistency compared to the serum. It has the same subtle scent as the other White Lucent products. It spreads easily and leaves your skin with a bit of shine yet doesn't feel oily or heavy. It's ideal for everyday use since it offers skin protection from both UVA and UVB rays. The bottle is also sealed, comes with a pump and transparent cap. I've been using this line for a couple of weeks now and they do work well in lightening my post blemish marks and targeting my uneven skin tone. All three didn't irritate my skin or cause breakouts and untoward skin reactions. I love that Shiseido threw in a lot of freebies on top of the discounted tag. They gave me a vanity kit with generous samples of the same products that I purchased. Overall, I'm loving the White Lucent line and I do recommend it to those who want to address uneven skin tone. 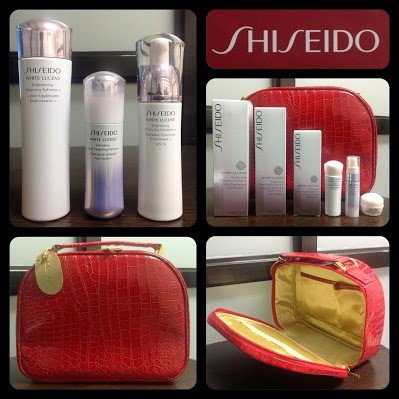 You may visit any Shiseido branch nationwide for further details on their promos. Any thoughts on Shiseido White Lucent? Do share it on the comments section below. Thanks for reading and have an awesome week!